As a seafood specialist, Tampa, Fla.-based Bonefish Grill is challenged to menu new species to lure return customers, says Leigh Merritt, director of food, beverage and product innovation. Recently, it introduced grilled branzino, also known as Mediterranean sea bass, as part of its Colossal Winter Menu promotion. 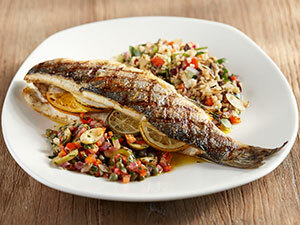 Not only was branzino a new species for Bonefish, this was the first time the chain featured a whole fish. What could have alienated customers was so well accepted, branzino has gained a permanent menu spot. While some new species are limited to regional launches, Bonefish wanted this item to run nationally. So, parent company Bloomin’ Brands tapped Mike Priebel, its senior supply chain specialist (a.k.a. “the fish whisperer”), to research vendors that could supply all 200 units. He found a U.S. source for sustainably farmed branzino. Servers were trained on the species and its sustainability story to share with guests. Merritt didn’t want to add too many ingredients and mask the branzino’s delicate flavor. Fresh lemon slices are stuffed into the cavity of each 14- to 20-ounce fish, then the whole branzino (with its head) is cooked on the oak-burning grill. “The simple preparation reinforces the fresh and healthy message we want to get across,” she says. Bonefish customers are “adventuring” with grains, says Merritt, and quinoa has resonated well. To take the familiar up a notch, one of the R&D chefs combined quinoa with wheat grains and red rice. He then added almonds for crunch and arugula for color to complement the branzino. As another accompaniment, the team liked the texture and acidity of a sofrito. But the Latin blend of green pepper, tomato, onion and garlic didn’t mesh with the branzino’s Mediterranean roots. So they added cucumber, feta and citrus to the base for a “Mediterranean sofrito,” as it’s called on the menu. When guests order the branzino, the server asks if they would like the head removed. Most—but not all—answer yes. “Since it’s the first time we’re serving a whole fish, we have to do a little more guest education, but the dish is overdelivering on sales expectations,” says Merritt.